Lignin, nature’s way of protecting plant cell walls, is difficult to break down or remove from plant materials called “biomass,” such as the non-edible parts of the corn plant. 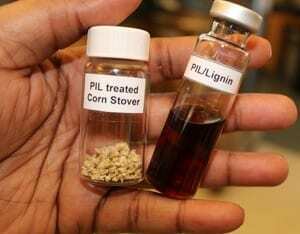 However, that lignin needs to be extracted in order to reach the energy-rich cellulose that is used to make biofuels. The researchers began by making a number of liquid salts called “protic ionic liquids” or PILs. These PILs are fairly inexpensive to prepare, because they are made by mixing together an acid, such as acetic acid (more commonly known as vinegar), and a base (a chemical class of materials called amines). As part of the pretreatment process, one of the PILs is mixed with biomass and then heated and stirred. The lignin dissolves into the PIL, leaving the cellulose behind as a solid. The cellulose, which is now much easier to process, is then easily filtered from the mixture for use in the next biofuel production steps. “This PIL-based technique can be easily scaled up and is likely to be both more energy efficient and less expensive than existing biomass pretreatment techniques for removing lignin,” Achinivu says. April 15, 2019 - Farmers, biodiesel producers need an economic lifesaver Des Moines RegisterA loss of biodiesel production would deliver another painful economic blow – not just to farmers, but also to consumers. WPP ENERGY'S TOKEN NOW LISTED ON TRADE.IO - EnerCom Inc.